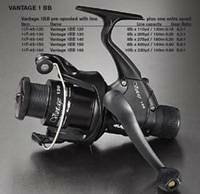 This series of front drag casting reels are equipped with 11 ball bearings and one roller bearing which will give you a very even line lay. The reels are very robust, while the weight, due to the ventilated aluminium spool and drilled frame is low. Equipped with ergonomically shaped handle in EVA for best grip. A new range of 9 ball bearing freespool reels in very large sizes. For the angler who targets the large fish, ideal for Carp, Catfish, Pike etc. 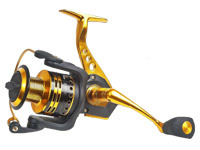 Also a great salt water reel that will cope with most species. Covered in soft matt black rubber for extra toughness and resilience. Instant Anti Reverse, Anti Twist Retrieve, Super strong gears. It also comes with two extra spools.